If it's been awhile since you visited Fairmount, here's a refresher course on what you're missing out on. Read on for a guide to some of our favorite Fairmount restaurants, music venues, and more. 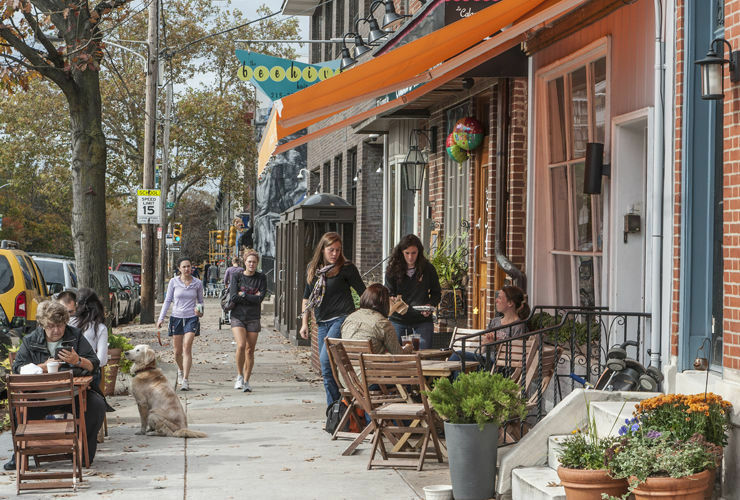 Let us know your go-to Fairmount hangout spots by mentioning us on Twitter and Instagram @Phillyfunguide, and use hashtag #FairmountFun! If you’re exploring Fairmount, you can’t miss Eastern State--literally. The decommissioned penitentiary takes up a full city block, and now opens its gates to tourists in the mood to learn some unconventional history, or just snap some beautifully spooky photos. Insider's tip: Don’t skip the audio tour--it’s narrated by Steve Buscemi! And the penitentiary’s staff and special exhibits are excellent sources of knowledge on prison reform and social justice issues related to mass incarceration. Right across the street from Eastern State, you’ll find one of our favorite bar/restaurants in the neighborhood: Urban Saloon. With a wide beer selection and great menu of bar food favorites, it’s a perfect dinner spot. On Monday nights at 8pm, catch up-and-coming Philly comedians at Laughs on Fairmount, the (free) open mic in the back room. For us, no day is complete without a jolt of caffeine, and when we're in Fairmount Mugshots is our first stop. Its name may allude to the neighborhood's criminal history, but you won't find any fingerprinting stations or dirty prison cells here; just great coffee, cozy seating and a variety of light snack and sandwich options. Philly's local music scene has never been better, thanks to indie venue mainstays like North Star Bar. This must-play room for up-and-coming bands is your best bet for great live music in Fairmount. Need a creative fix? Since 2004, Philly Art Center: Fairmount has offerred classes for all ages as a community hub of creativity. Sign up the kids for art and music, or unleash your own inner artist with more advanced adult classes in painting, sculpture and screenprinting. Check out our top picks for fun events & venues in South Philly! Want to know when your favorite Fairmount events are 1/2-price? Then sign up for our weekly Funsavers email!